Public toilets in Malaysia are known for its notoriously unhygienic and dirty condition, sad to say. Even toilets in upscale shopping malls are not very clean either. Not to blame the maintenance but the blame is purely put on the public, the toilet users themselves. How pathetic and sad is it that we see a lot of toilets have to put up reminders and warning signs about toilet etiquette, the do's and don'ts in a toilet when these things are basic things that we do and do not do at our toilets at home. Are Malaysians becoming more and more lack of civic consciousness? Is this attitude derived from the 'tidak apa' attitude? Sad, isn't it? However dirty and unhygienic the public toilets are, unfortunately, when nature calls, nature calls and there's no way of putting off the call, unless you have superpower bladders and gut! Kleenex® has recently commissioned an independent online survey which polled some 1,160 women and men in Malaysia. Overall, the survey revealed that revealed that three out of five Malaysians are extremely hesitant to use public toilets, citing common reasons such as wet, dirty floors or toilet seats, clogged or unflushed toilets, and lack of water or clean water and toilet paper. Specifically on personal cleaning, participants’ most common complaints were attributed to dirty water hoses (60%) and no water and toilet paper being provided at all (37%). The survey also found that many Malaysians modify their behaviour solely to avoid using public toilets. For instance, four out of five who were surveyed mentioned that they consume less drinks to minimize visits to the public toilets while they are out and some feel compelled to carry their own supply of cleaning water wherever they go. The survey results showed that a majority of Malaysians (67%) think that what they wear as well as the things they carry around make it inconvenient to clean themselves properly in public toilets. I have a 4.5 year old girl who is obviously not wearing diapers anymore so every time we go out and she needs to answer her nature calls, I dread a little because the thought of going to the public toilet with her really puts me off. Some public toilets in Malaysia are equipped with child-sized toilet bowl while the toilet bowl in Empire Shopping Gallery, Subang has a smaller toilet seat cover attached to the toilet seat. You can pull down the smaller toilet seat cover for your child to sit on. Even with the toilet seats, most of the time I encounter dirty toilet seats so I had to take out my own tissue because 99% of the time, tissues are not available too! Sigh what a chore going to toilets these days! Guess what, according to the survey, one in two respondents believe that using wet tissues is the most ideal solution as opposed to having to go through the inconveniences of dealing with situations when there is no water or toilet paper available. 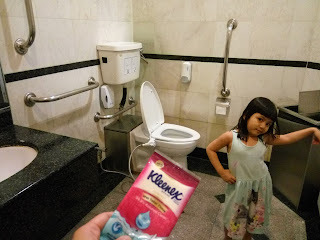 With the ever growing problems and inconveniences of using public toilets in Malaysia, Kleenex has cleverly come up with the perfect solution, that is an all-new Wet Toilet Tissue. What is this wet toilet tissue, you may ask. “Kleenex® Wet Toilet Tissues is the first of its kind in Malaysia, made with consumers’ out-of-home cleaning needs in mind. Its compact packets are easy to carry around and easy to use – just wipe and flush,” said Mr Raman Tarun, Marketing Director, Kimberly-Clark Malaysia. “Sometimes we don’t realize how a tiny addition like this in our bag can make such a huge difference – it’s just like personal hygiene in a pocket.” *Safe to flush and hypoallergenic, the Kleenex® Wet Toilet Tissues are formulated with 9-step purified water for 99.9% assured clean and gentle and delicate on the skin, leaving users feeling cleaner and fresher after use. Celebrity brand advocate Jihan Muse said, “Surviving a public toilet is like being in an epic tragicomedy – you should see me in my high-heeled sandals and long, flowing dress, trying to juggle shopping bags, negotiating the wet floor while holding my dress up and hoping I don’t drop anything!”I can so relate with you, Jihan! So you can imagine me with my child, shopping bag(s), my handbag and also her handbag and Mimi the cat (yes, my girl carries a handbag and her stuffed cat called Mimi when she goes out, she's a lovely and loving little diva, thank you very much). 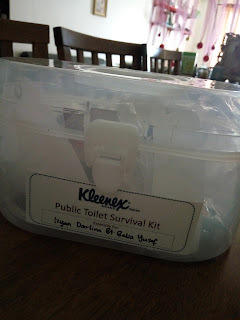 Since going to public toilets are becoming a chore, don't you wish that you have this 'Public Toilet Survival Kit' with you at all times? These things will definitely come in handy when going to a public toilet huh? Too bad the kit is bulky to be put in our handbags! Thanks to Kleenex® Wet Toilet Tissues I am glad to say that I don't have to lug the kit with me all around. All I have to do is put a packet of this wet tissue into my handbag. The size is compact so it feels like bringing next to nothing. Now I don't need to worry about dealing with unhygienic and dirty public toilets anymore and cleaning myself and Babycakes are made easy with Kleenex® Wet Toilet Tissues. 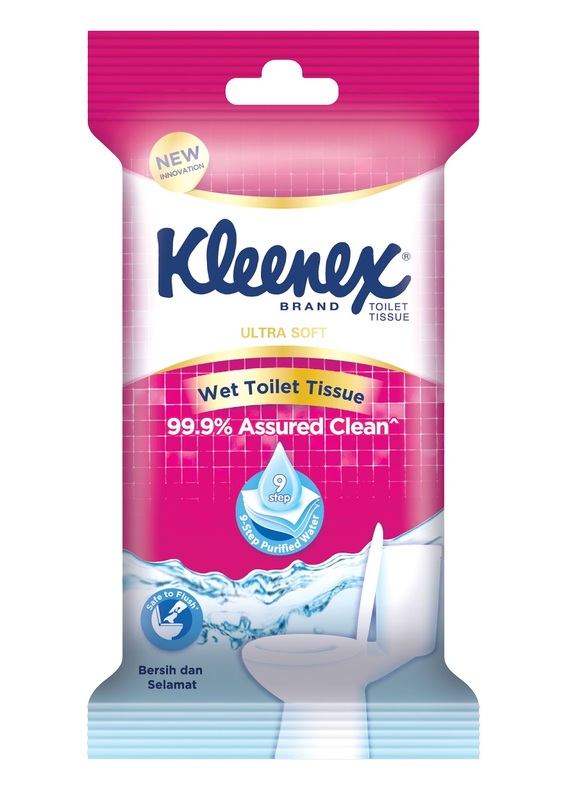 Kleenex® Wet Toilet Tissues are available in three sizes – a pack of 10 sheets that can be placed in one’s pocket or handbag (RRP RM2.10), a value-saving pack of three (RRP RM5.80), or a 40-sheet pack (RRP RM7.40). All three sizes are now available in leading hypermarkets and supermarkets nationwide. 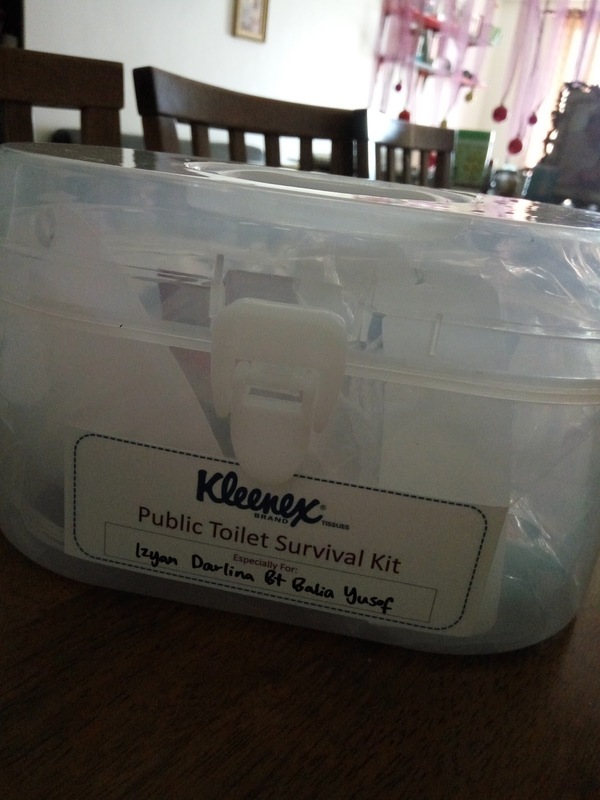 If you are interested to try and learn more about this awesome product, you can join Kleenex® and Jihan Muse today to Survive Public Toilets. 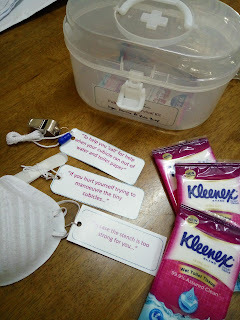 Request a free sample pack and participate in a simple quiz contest to win a year’s supply of Kleenex® Wet Toilet Tissues by registering at www.kleenexcleans.com.my. Users are also encouraged to share their experience using this brand-new product on social media by using the hashtag, #KleenexSurvivalGuide. 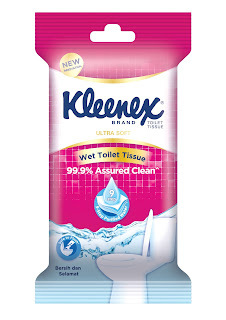 For more information on Kleenex® in general, log on to the Kleenex® Malaysia Facebook page (www.facebook.com/Kleenex.Malaysia) or call the Kimberly-Clark Consumer Care-line at 1-800-82-1188 (toll-free) on weekdays from 9am to 5pm. *Advisable to flush no more than 2 sheets at a time; not suitable for use in septic tank.